Mod is a subculture that originated in London in the late 1950s and peaked in the early to mid 1960s. 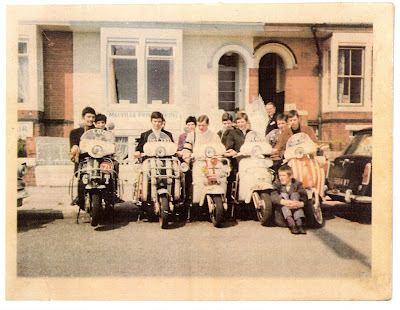 Significant elements of the mod lifestyle included pop music, such as African American soul, Jamaican ska, and British beat music and R&B; fashion (often tailor-made suits); and Italian motor scooters. The mod scene was also associated with amphetamine-fuelled all-night dancing at clubs. The mod scene developed when British teenagers began to reject the "dull, timid, old-fashioned, and uninspired" British culture around them, with its repressed and class-obsessed mentality and its "naffness". From the mid to late 1960s onwards, the mass media often used the term mod in a wider sense to describe anything that was believed to be popular, fashionable or modern. For mods, Italian scooters were the "embodiment of continental style and a way to escape the working-class row houses of their upbringing". They customized their scooters by painting them in "two-tone and candyflake and overaccessorized [them] with luggage racks, crash bars, and scores of mirrors and fog lights", and they often put their names on the small windscreen. Engine side panels and front bumpers were taken to local electroplating workshops and recovered in highly reflective chrome. Scooters were also a practical and accessible form of transportation for 1960s teens. 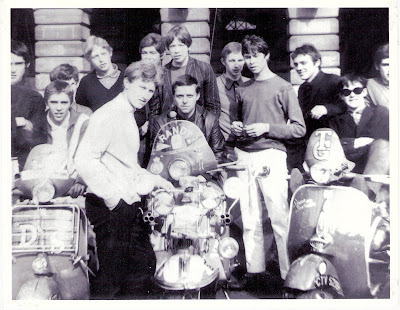 In the early 1960s, public transport stopped relatively early in the night, and so having scooters allowed mods to stay out all night at dance clubs. To keep their expensive suits clean and keep warm while riding, mods often wore long army parkas. For teens with low-end jobs, scooters were cheaper than cars, and they could be bought on a payment plan through newly-available Hire purchase plans. After a law was passed requiring at least one mirror be attached to every motorcycle, mods were known to add four, ten, or as many as 30 mirrors to their scooters.